COPE councillor Jean Swanson has submitted a motion for consideration to “suspend, as soon as possible,” the development cost levy waiver private developers are provided for building market rental housing, until a review of Rental 100 is completed. “The city now has the ability to zone for rental only so we don’t need incentives for rental construction as a way of preventing condo construction,” wrote Swanson. Rental 100 was implemented in 2012 to provide new rental housing options for households — both individuals and families — earning $50,000 to $150,000 per year, flooding the once-stagnant rental market with new supply. But she asserts it has not done enough, claiming it should also have a mandate to provide affordable housing for lower-income households earning less than $50,000 per year or those at risk of homelessness. In 2019, according to updated city guidelines, starting rates under Rental 100 in the Westside cannot exceed $1,768 for a studio, $2,056 for a one-bedroom unit, $2,703 for a two-bedroom unit, and $3,559 for a three-bedroom unit. Rates in the Eastside are slightly lower at $1,607 for a studio, $1,869 for a one-bedroom unit, $2,457 for a two-bedroom unit, and $3,235 for a three-bedroom unit. “While this increased supply in rental housing has been welcome and has addressed the needs of many middle-income households, the level of affordability that can be delivered in market rental homes continues to be a challenge for households in the lower-income bands,” she wrote. If this motion goes through, it will supplement another motion approved just a few weeks ago to review the same rental incentives program. Other incentives provided under Rental 100 including parking requirement reductions, allowance for smaller units, additional density beyond what is permitted under existing zoning, and expedited processing for projects requiring a rezoning. Without the development cost levy waiver and other various incentives, developers are unsure whether privately-funded rental housing will still be financially feasible to build, and the uncertainty could put a damper on new proposals. A suspension of Rental 100’s incentives could last for nearly a year, as city staff are not expected to return to city council with policy alternatives until winter. City council is currently scheduled to consider Swanson’s motion in a meeting next week. Swanson has been one of the most outspoken critics of Rental 100 in city council, and has voted against all applications for market rental housing this year to date, going against the majority of councillors who voted in favour for all of the projects. During the public hearings for these projects, she made on a number of occasions amendments that would change the rental rates to make the developments more affordable, but her amendments failed to pass each time. “Current uncertainties on the future of Rental 100 and if a deeper level of affordability requirements will be matched with the requisite density are causing many to sit on the sidelines,” Jon Stovell, president of Reliance Properties and chair of the Urban Development Institute, told Daily Hive. 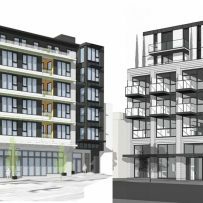 Since 2017, over 1,800 rental units have been approved under Rental 100, with supporters of the policy stating these same units would have been built as market ownership units without the incentives to build rental housing. The rental vacancy rate in Vancouver is currently hovering at less than 1%, providing households depending on rental housing with extremely few housing options. According to the city, a healthy vacancy rate ranges between 3% and 4%.